In a word: What's going on on the floor? Nichole had a Diet Coke. The bill was $0 (thanks, bartender!) plus tip. JM and John gave Segredo a D+; Nichole gave Segredo a B- (see our grading rubric). 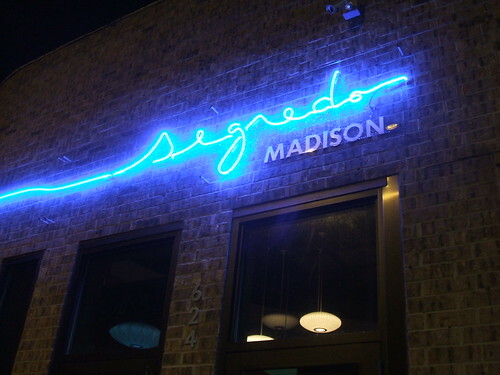 We went to Segredo, a campus-area club, at 9 on a Thursday night based on information gleaned from their website. The place was deserted save for two women who meandered in before us and disappeared. Inquiring at the bar, we found out that food service stopped at 9pm (the opening time listed on the door and online) and that the bowling lanes we'd looked forward to trying had been replaced by a dance floor in a recent re-visioning of the club. Only the ball returns remained, stowed under tall tables at the edge of the dance floor. For this deluge of disappointing news, the bartender sounded apologetic rather than impatient with our misinformedness, and comped us (that's #4) three sodas in plastic cups. The space is not bad for a club, broken up into a medium-sized dance floor with two projection screens over it, multiple bars, and a few loungey alcoves. The barstools are like Crave's (maybe they are the selfsame chairs) and the satellite DJ mix was middling to fair. Strictly speaking, since we didn't get any food, the Ds from the men are in keeping with our grading rubric. Segredo has some things to sort out (like its posted hours, or, oh, its identity) before we'd consider it a place to go eat. We have no idea what the place is like at 1am; maybe that's when it's most itself. But we wouldn't expect to eat there. The food was decent, but it's grossly overpriced. I wouldn't go back. This is the most depressing food review ever written. It should be pointed out that the lack of bowling is a forced re-visioning of the club. I don't have all of the details yet, but apparently one of the city department's is refusing to allow them to have bowling - which is sort of their entire business plan. Thanks for reminding me that I meant to follow up on this. Jesse, please do. I'd like to hear the rationale for that. Heh, Timmy. "Depressing" is subjective, but we don't write food reviews. Yes, you do. You may write a review once in a awhile that is not entirely food related, and you will (very rarely) post reviews that don't even have anything to do with food (above), but your blog is called Eating in Madison A to Z. You give ratings. People that visit, or comment on your blog, do so for the food (for the most part). If you are uncomfortable with that distinction, rename your blog, and do away with the ratings. Simply stating that you don't write reviews will not stop people from taking your opinion in that manner.